The dynamic performance of a vehicle is mainly determined by the interaction of its tires and road. A vehicle can only move and maneuver by the force systems generated under the tires. 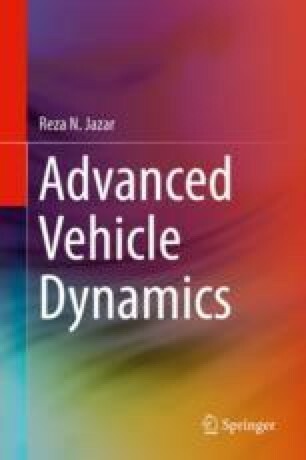 In this chapter, we introduce the required coordinate frames to determine the location and orientation of tires in the vehicle body coordinate frame; the mathematical equation to calculate longitudinal and lateral forces; and individual equations needed to develop dynamic equations of vehicles in the following chapters. The resultant force system that a tire receives from the ground is at the center of the tireprint and can be decomposed along xt, yt, and zt axes of the tire coordinate frame T. The interaction of a tire with road generates a three-dimensional (3D) force system including three forces and three moments. The force system at the tireprint of a loaded, rolling, steered, cambered tire includes: forward force Fx, lateral force Fy, vertical force Fz, aligning moment Mz, roll moment Mx, and pitch moment My. The forward force Fx and lateral force Fy are the most significant forces in vehicle maneuvering. To accelerate or brake a vehicle, a longitudinal force must be developed between the tire and the ground. When a torque T is applied to the spin axis of a tire, longitudinal slip ratio s occurs and a longitudinal force Fx is generated at the tireprint proportional to s. The tire lateral force Fy is a function of two angles of the tire: sideslip angle α and camber angle γ. The Fx and Fy take the tire load Fz, sideslip α, longitudinal slip s, and the camber angle γ as input. We adopt the proportional-saturation model for longitudinal and lateral slips of tire. When α = 0, a small longitudinal slip s < ss generates the longitudinal force Fx∕Fz = Css, and when s = 0, a small sideslip angle α < αs generates a lateral force of Fy∕Fz = −Cαα. When there exists a longitudinal slip s < ss and then we also introduce a sideslip α < αs, the longitudinal force will reduce. Similarly, when there exists a longitudinal slip s < ss, the lateral force will drop. The elliptic mathematical model introduces the analytical expression of the interaction Fx∕Fz and Fy∕Fz. Because the longitudinal and lateral forces are affected by the vertical force Fz on the tire, there must be a model to calculate the weight transfer during forward and lateral acceleration. Such equations are calculated in this chapter.